Well, I this morning had my first ever face-plant while fishing. Glad that’s over. It was so worth it. I awoke at 2:45 am to make a PB&J, chug some coffee and hit the road for the Farmington. I’ve not seen that pretty gal in some time, and with news of Tricos in the air, I wanted to give it a go. I arrived at the river around 5:30 am after a pit-stop and the obligatory visit to Dunkin’ Donuts–and, was the second angler there. Over the next few hours, it became quite a large crowd. Tricos do that to sane people. They make anglers riled up. Last summer, I remember a 21-fish morning, with the water low and ideal for dry flies. A drought can do that, as well as a hot summer. Thankfully, I was onto fish pretty quick. This one wasn’t huge, but it made me smile and smile. The skunk was off. The Trico hatch and spinner fall were different today from last year. Not that robust. Maybe I’m catching the tail end of the progression up the river. It’s fine either way. I’m just glad to be on the water. There were plenty of bugs all around. Wow, were they tiny. My #20 Drowned Trico Spinner looked huge in comparison and was a different color. I must remember to think about making some grey Tricos next year. And, the fish were really selective. I saw two other anglers, each with one fish on at some point, but others were getting blanked. Maybe my homemade Harvey Slackline Leader helped? Next up was a complete face-plant into the river. I didn’t realize there was a rock behind me, and I turned and dropped down to do a quick push up. I suppose it is inevitable, given all the time I spend on the water. So, my fly fishing Baptism has finally happened. After a bit, the surface activity stopped. I switched spots a few times and did some tightlining. I immediately found some larger fish. The biggest was this one, which taped at 14″. The yellow elastomer behind the left eye means this is a Survivor Strain fish stocked in 2016. So, no biggies, but I’m amazed how tightlining produces and helps me meet larger trout. If you fish, I find that September-ish is the toughest non-winter month for me. My suggestion is to fish small. I landed eight fish from the 16-ish takes I witnessed (much human error!). 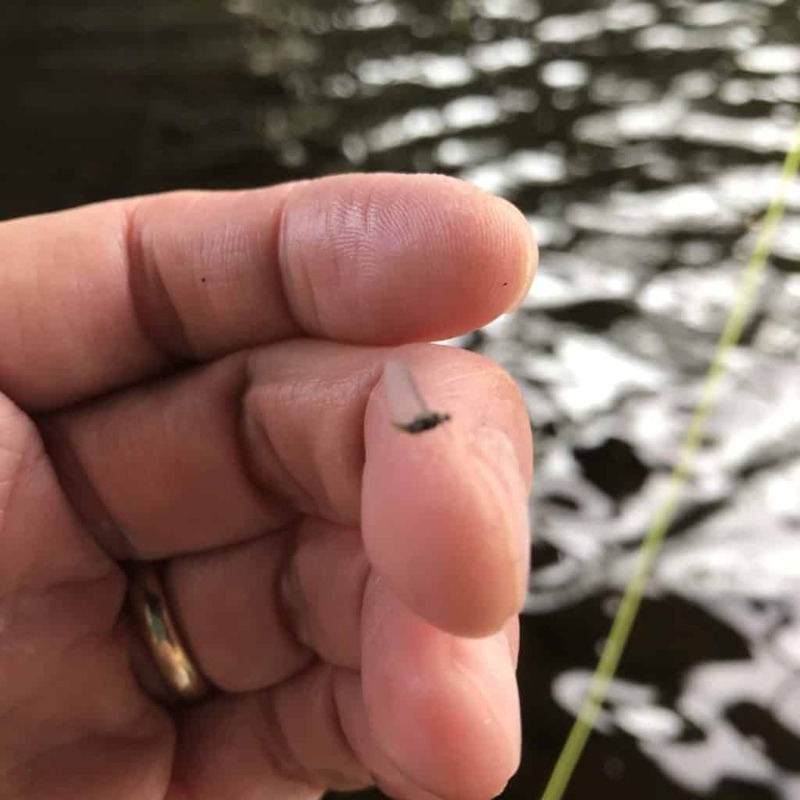 Nearly all the fish landed came on really small flies, from sizes 20 to 26. I stomach-pumped one fish. All I saw were tiny critters. 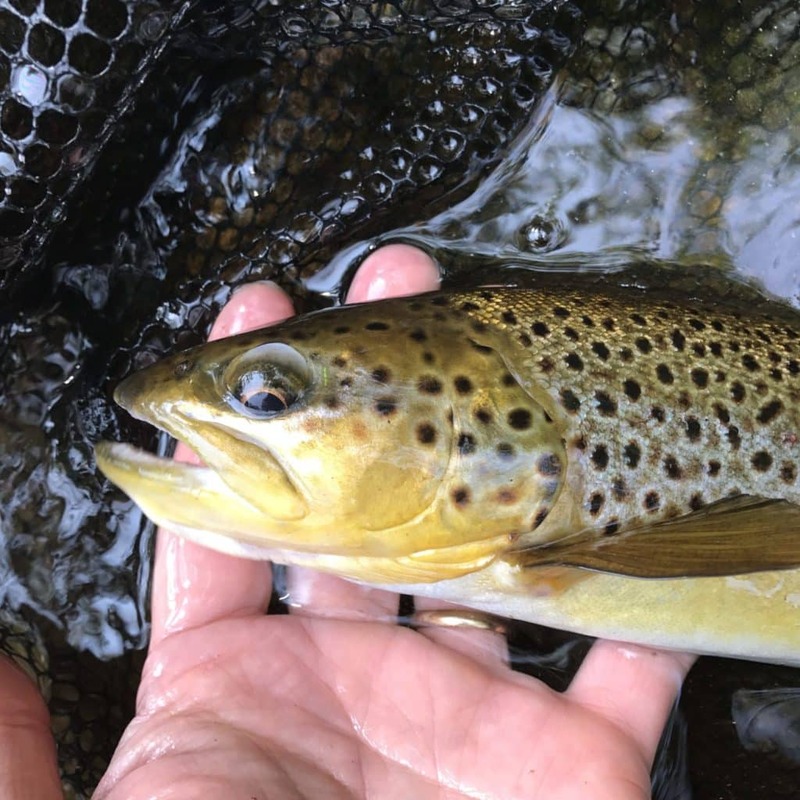 Conditions will improve once the brookies start spawning, and the autumn stocking takes place. For me, it was worth the drive and the dousing. Haven’t fished at all this August, and it was good to be back on the water. That bug looks like a dun stage. The wings are almost a light dun color. Tricorythodes spinner wings are typically completely transparent. I don’t even fish a trico pattern for the duns in CT, I fish smaller olives and callibeatis patterns. It’s the spinners that are black and clear winged. For me Tricos are hit or miss. Mostly miss! Slipped for the first time in memory this Summer on the Farmington. 8″ round rock in 2′ of water did me in! Shipped a little water and thankfully only my pride was damaged. Glad you survived your fall without injury. It’s always good to get it out of the way in the summer when it’s warm and you can keep fishing. Female and male tricos are different colors and the fish may become selective to one or the other. Females have a light olive abdomen until they lay their eggs (which are olive in color), when they look whitish or gray with a dark thorax. Males have a black thorax and abdomen. I fish a female imitation early in the spinner fall and a male imitation later, since the females apparently fall first. It might not make a difference, but with this hatch, I’ll take anything that makes it feel like I have an advantage. I fished a famous dry fly pool on Friday and the water was covered with a huge number of spinners, but fish were only rising occasionally. 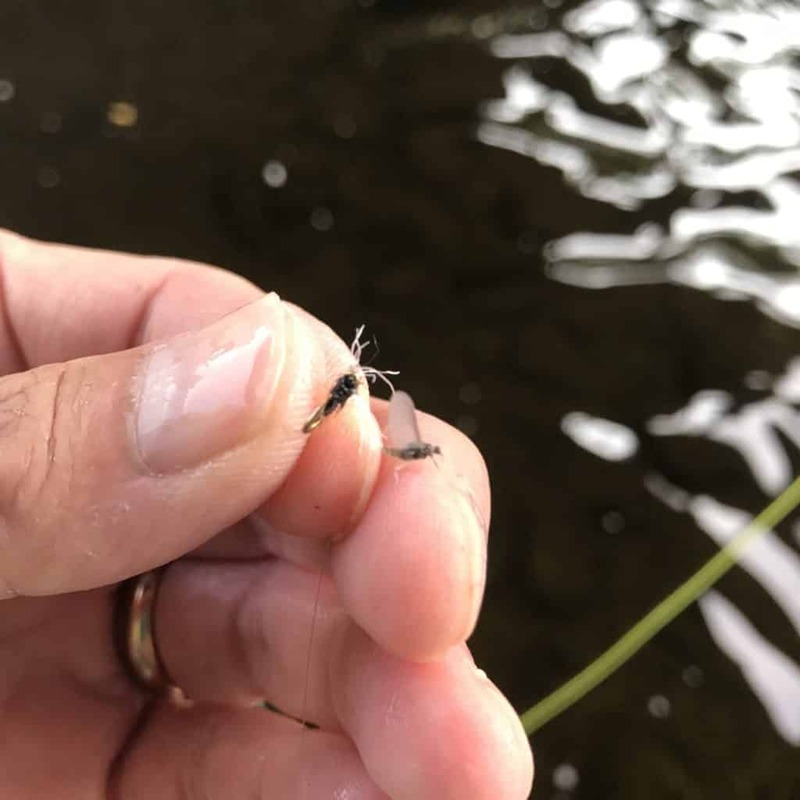 Almost impossible conditions… if the fish are only going to sip once in a while, it’s basically impossible to get your fly noticed among the thousands of naturals. 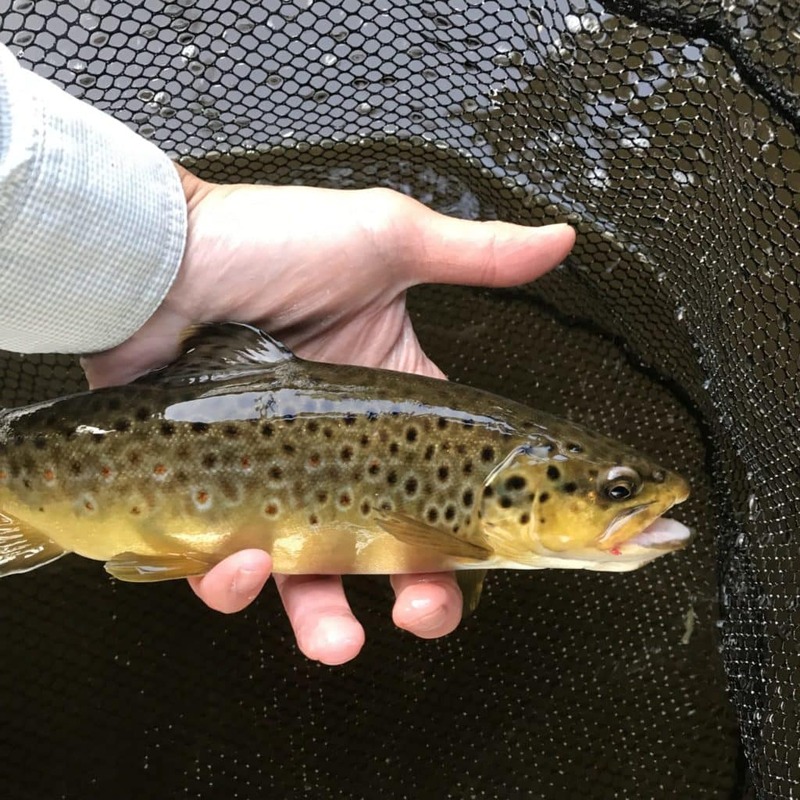 I moved upstream to another famous dry fly pool and found more cooperative fish rising steadily (gulping really) and quickly landed a few before the rise shut down. Puzzling how two similar pools a mile apart could fish so differently, but if it was easy to figure out, it wouldn’t be nearly as much fun! Hi Brendan, thank you for the detailed feedback. I’ll tie up some Drowned Spinners with olive wire, too, which Ed Engle also recommends in his Tying Small Flies book. Fishing during a Trico situation is extremely addicting. I forgot to mention in my post that all of my Trico takes were on the Drowned Spinner, not up top. 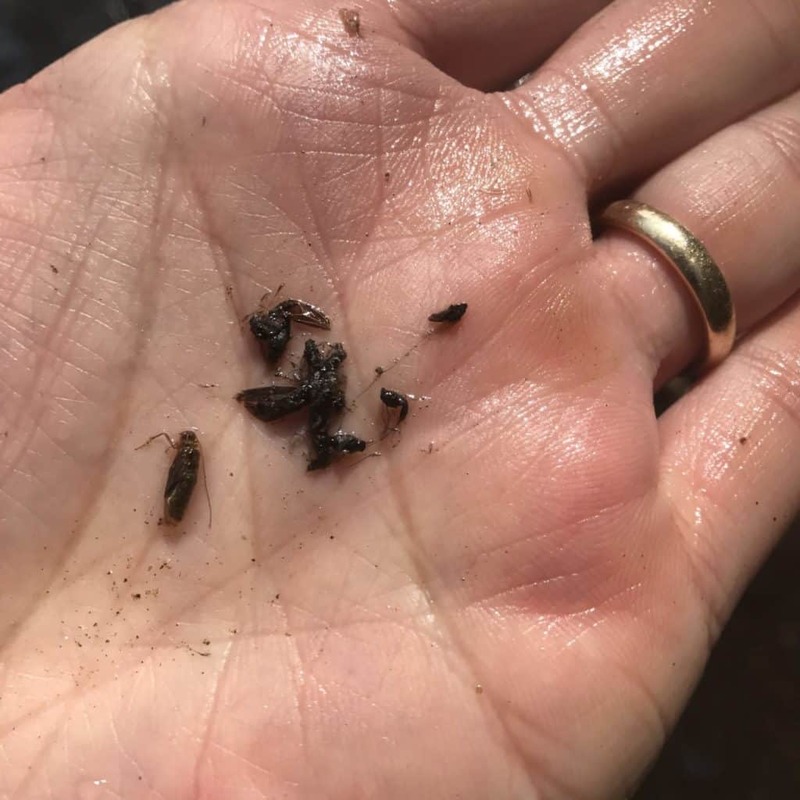 Engle says that as the Trico hatch progresses later and later, the savvy fish realize they don’t need to slurp up top, as they’ll get plenty of food from the drowned bugs. Sorry you took a Dixie; I did the same last time on the Farmington. Maybe it is my age and general unsteadiness at times, but I find that river very hard to wade. My brother on the other hand, who I was fishing with, was wading around no problem without a wading staff. Luckily he had a wading staff in his truck that he went back and got for me, and that made the day more enjoyable. I won’t fish the Farmington again without one. He caught a dozen browns to my zero, but he didn’t give me too hard a time about that. I must have had as many swings and misses on dry flies, but could not connect that day for some reason. That happens to all of us! Some days are just tough ones.